An average sized cage for beginners. 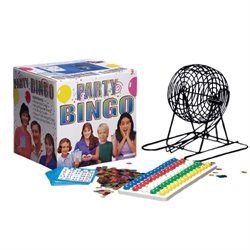 This set is the perfect starter kit with every thing you need for your private Bingo game. The cage comes with a set of bingo balls that are 7/8 of an inch in diameter, a masterboard, 18 reusable cardboard cards, and 300 bingo chips to be used as markers.